Well, the cookie DOUGH is amazing…. it barely made it to the oven! They DEFINITELY needed more than the allotted time (literally doubled it). I measured the flour as directed, but they still came out a little dry. Great flavor though, no regrets! I have a few questions. 1. What do you mean with the flour by fluff, scoop, and then sweep? 2. I’m guessing salted butter, and is it okay if it’s liquidy after being microwaved? 3. Is imitation vanilla extract ok? 4. 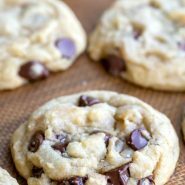 Will this recipe work being tripled or quadrupled (I’m making cookies for my husband’s shop and will need 70+) Thank you in advance! Hi! 1) Flour packs easily. If you stir it or sift it (fluff it up) before you measure it, it helps to get a more accurate measurement. 2) Yes, salted butter will work fine. The butter should be melted but shouldn’t be sizzling hot. If the butter is mostly melted, just whisk it until it is completely melted. 3) Yes, that will work! 4) I haven’t tried it to say for certain. Not every recipe scales without adjustments, and I don’t want to steer you wrong. Hope that helps! 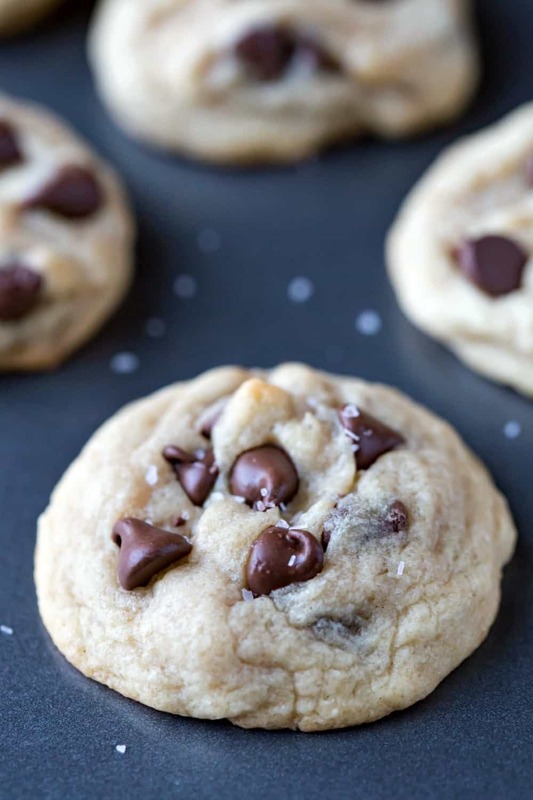 These cookies are 5 star, they bake up beautifully and are extremely delicious! I eat with my eyes dust and couldn’t believe how gorgeous and fluffy they were. Not cakey, a little chewy and the measurements were exactly right. The only thing I added was a tsp of espresso powder, and a little more salt. I also sprinkled sea salt on the dough before I baked them. Yay!! I’m so glad that they came out well for you! The sea salt on top is a great addition. =) Thanks for coming back to comment! 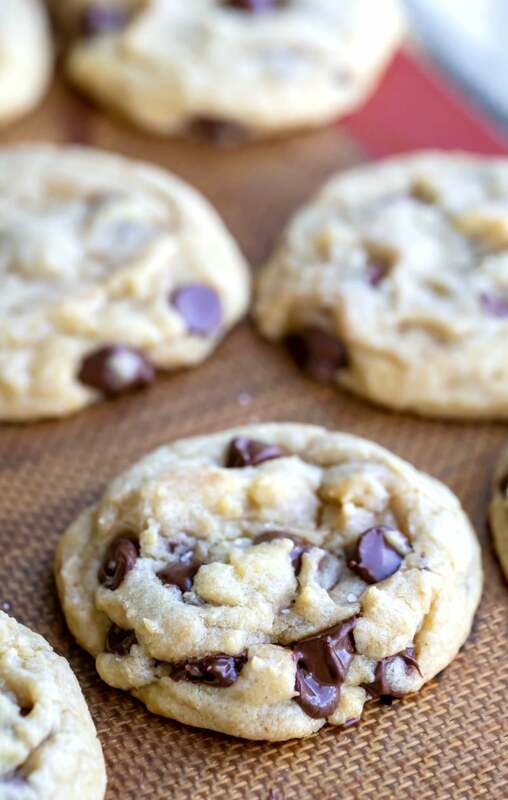 I have been on the hunt for a “go to” quick, easy and delicious chocolate chip cookie. My husband is always craving them! I have tried so many over the years and never found the one… until this recipie! I have made it probably 8 times already and everyone loves them. Especially the hubby. THANK YOU! Can this cookie dough be refrigerated or frozen for later use? I haven’t tried it with this recipe, but I don’t see why not. Hope that helps! I felt like I messed the whole recipe up because I had not enough flour, no chocolate chips, and not enough brown sugar. But, the cookies still tasted great! Thank you! I’m so glad that you liked the cookies. =) Thank you for coming back to comment! Yay!! I’m so glad! I love the flavor that almond extract gives to cookies. =) Thanks for commenting! Really good recipe. Thank you!! Can you substitute coconut flour and stevia? There probably is a way, but it wouldn’t be a simple 1:1 swap with the coconut flour. Coconut flour acts like a sponge, and the liquid and eggs in a recipe have to be adjusted accordingly. 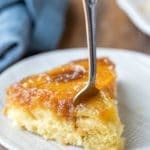 Unless you’re up for experimenting, I think you may have better luck finding a recipe that already uses coconut flour. 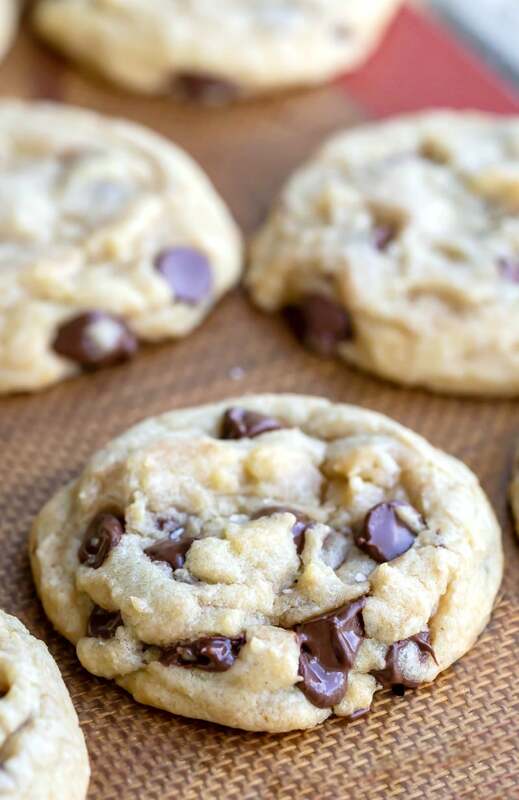 Very easy to make, I used hershey’s special dark chocolate chips!! I did adjust the baking times just like you said would vary. Thanks!! I’m so glad! 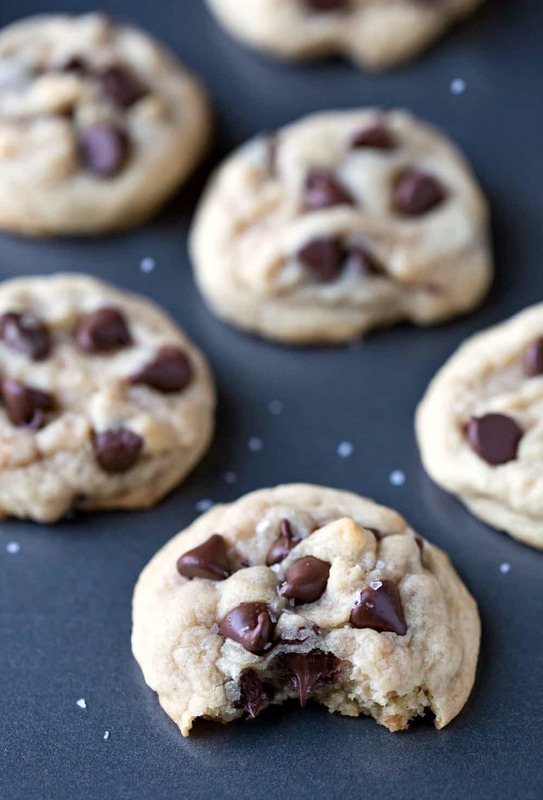 Good choice with the chocolate chips – those have great chocolate flavor. =) Thanks for coming back to comment! Thank you! =D I’m glad that you liked the cookies! =) Thanks for commenting! Made these cookies and EVERYONE LOVED THEM! They did require a little more baking time however they came out perfectly. 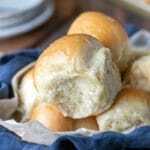 I bookmarked the recipe and will make again! Oh my gosh! I wanted to make cookies today but was out of energy. 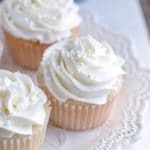 I whipped these up in just a few minutes and they are delicious! In my opinion, as good as my regular chocolate chip cookies. Thank you! Thank you! I’m so glad that you liked the cookies! =) Thank you for coming back to comment. I’ve made these twice now, both times they taste great but they don’t look like yours. Mine never flatten out, they still have the shape of the scoop of dough almost. Any tips? Thank you! How are you measuring the flour? The lack of spread usually comes from a bit too much flour in the dough. Try using a little bit less, and that should help. If you have any other questions, please let me know!